Please award yourself a GOLD STAR if you can tell a sea lion from a seal. The group that includes all of the seals and sea lions is the PINNIPEDS. Sea Lions are the ones that can balance beach balls on their noses and hang out at Pier 39 in San Francisco, posing for tourists’ iPhone pics. They’re the ones that “perform” in grotesque shows at places like SeaWorld. They can clap their large flippers together and “walk”. Sea Lions are usually black and have external ear flaps. 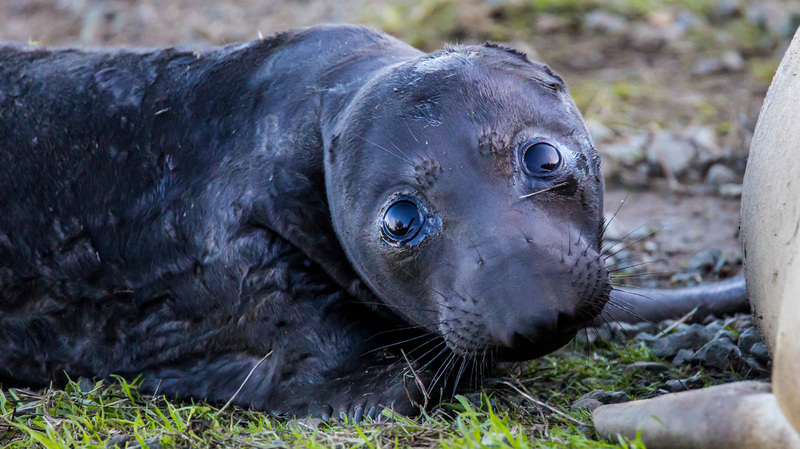 Seals (aka “true seals” or Phocids) don’t have visible external ears, and have much smaller flippers. They can’t “walk” like sea lions. 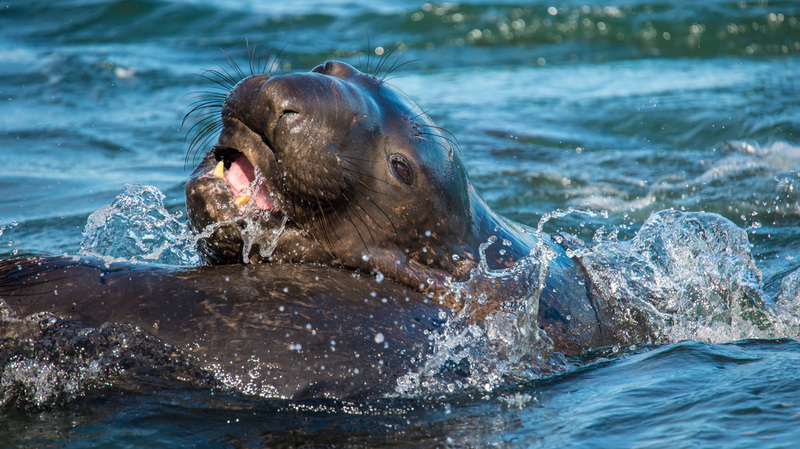 Around here, we usually see two kinds of seals -- Harbor Seals and Elephant Seals. Yesterday, during my photo expedition to the Chimney Rock area at Point Reyes, I saw and heard hundreds of Elephant Seals of all ages resting on the beaches and cavorting in the water. The first photo shows a very young pup Elephant Seal resting on the beach beside his/her mom (grey shape on the right). I took the second photo as two young, probably male Elephant Seals thrashed around in the water in what looked like playful fake-fighting, probably a rehearsal for the real fighting later, as adults, that establishes which bull Elephant Seal will dominate a section of beach and a harem of up to 50 females. Big bull elephant seals produce very strange, very loud, very-low-frequency vocalizations that are amazing and sound like ---- absolutely nothing else. It’s worth a trip just to hear that very strange sound. It was a frosty 25° as I drove through S. P. Taylor State Park around 7:00 AM today, rising to about 33° passing through Inverness. CHILLY! But that’s good, because it kept most of the holiday visitors inside their cozy West Marin B&Bs, wrapped up ostentatious bedding that can only be described in French. So, I had the park to myself for a couple of hours until the temperature climbed into the 40s around 10 or 11. I took photos of all but the Harrier, but my personal favorite, the Cooper’s hawk, was also chosen by our highly opinionated Photo Editor as Creature of the Day. SPECIAL NOTE TO NEW RECIPIENTS of CotD: Congratulations! You have been selected to receive Creature of the Day absolutely free! WOW! That’s almost as cool as joining a bizarre secret cult, except Tom Cruise isn’t a member. Creature of the Day includes photographs and incoherent ramblings from Dave at intervals based on a mysterious algorithm that includes – in addition to Greek letters, strange symbols, and imaginary numbers -- STOCHASTIC VARIABLES. (And we all love STOCHASTIC VARIABLES, don’t we?) If you feel that CotD is an insult to your inbox, your intelligence, and your good taste, please reply to this email with the subject line F&^%$#-OFF DAVE! and your name will be cheerfully removed from the subscriber list. Otherwise, you have a lot of catching up to do, because I’ve been publishing CotD since 2009. There will be a quiz. Today’s non-creature photograph celebrates RAIN in the Bay Area. 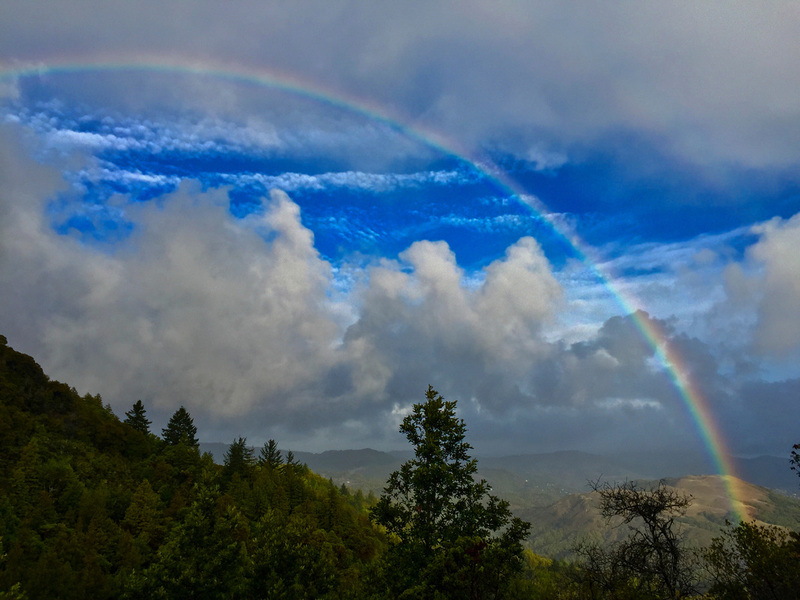 This fine rainbow appeared for about 1 minute around 8:30 this morning as I was riding my bike up Eldridge Grade. I jumped off my bike, twisted out of my backpack, and extracted my iPhone as fast as I could. Activate, finger-print scan, home screen, camera, HDR-on, turn iPhone sideways (landscape), touch screen to focus and set exposure, CLICK -- just in time. Then the rainbow faded away as the wind rearranged the clouds and the light changed. Ephemerality is one of the great properties of a rainbow. However, ephemerality can be mitigated with a camera! I’m not a (full-time) snob about most things*, but I can be condescending and dismissive about phone cameras, because most of the photography I do is impossible without more sophisticated equipment. BUT the thing about a phone camera is its F#@$%&#@ UBIQUITY! PHOTOGRAPHER’S ADAGE: The best camera is the one you have with you. OK, I grudgingly admit it; the camera in my phone (iPhone 6) is quite decent for a picture like this. *Speaking of snobbery, I do prefer artisanal products and services, although the word “artisanal” itself is dubious. I have a copy of the Oxford English Dictionary (Compact Edition, the one with the very tiny print that comes with a magnifying glass) and the word “artisanal” isn’t in it. When I asked Don, my tire guy, if he could put artisanal steel-belted radials on my Dodge Caravan, he said “NO”. I was disappointed. Oh sure, artisanal goat cheese is easy, but I wonder about artisanal medical procedures, like the periodontal graft I had a while back. Perhaps I am over-sharing. How many of you think that FEDERAL REGULATIONS are cool? Well, it’s a tough question. For example, cannabis is still a Schedule 1 substance (like heroin!) under US federal law. Wow. Just FYI, cannabis is legal in Uruguay, Bangladesh, and -- surprise -- the US Virgin Islands. Oh, and the Netherlands, but everybody knows that. Honestly, I’m not a fan of cannabis; I’m just sayin’. But on the other hand, sometimes FEDERAL REGULATIONS work out very well. Here’s an example: The Snowy Egret, which has beautiful white plumage (and which is especially dazzling during the breeding season) was hunted to near-extinction for its feathers. The feathers were used in hats and other fashion items until the Migratory Bird Treaty Act was passed by congress and signed by the president in 1918. Now, nearly 100 years later, Snowy Egrets are quite common. See what I mean about FEDERAL REGULATIONS? Darn it, I like the Migratory Bird Treaty Act. I’m so glad we’ve covered the subject of FEDERAL REGULATIONS. Remember, our goal at Creature of the Day is to inform our subscribers. Snowy Egrets are often seen in the same environments as Great Egrets, also a big white bird with a long neck and similar feeding habits. 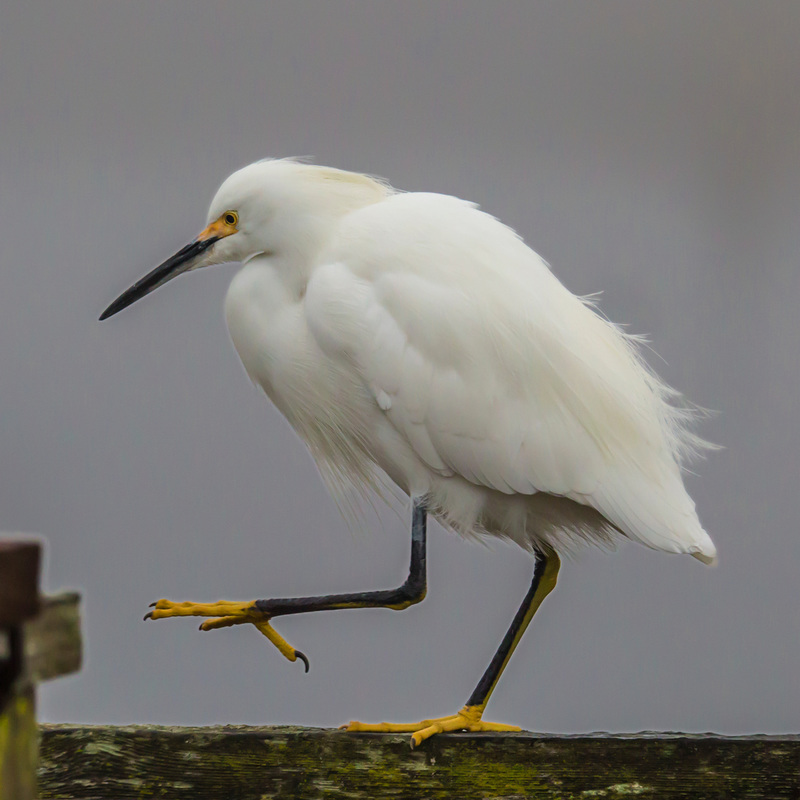 It’s easy to differentiate the two birds: Snowy Egrets have black bills, black legs, and yellow feet. Great Egrets are much bigger and have yellow bills and yellow legs. I took the attached photo early this morning at the Las Gallinas “ponds”. We’ve discussed the “ponds” before. They’re sewage treatment ponds near San Rafael, and the birds really love them! I’m so sorry if you’re grossed out. Hey, I’m just the messenger. I know some of you are very sensitive and feel you should have had a TRIGGER WARNING before I mentioned sewage treatment ponds. This is NATURE we’re discussing, and nature can be messy. On Friday, Sherrie and I hiked to Tomales Point. This is a spectacular 9½-mile out-and-back that starts and ends at Pierce Point Ranch in the northernmost section of the Pt. Reyes peninsula. It was a beautiful day for the route -- bright and clear, and cold. We got an early start and saw many dozens of Tule Elk, spouting whales off-shore, and lots of different birds – as well as non-stop dramatic views of the landscapes and seascapes that surround the area. I usually don’t take my camera on our weekly hikes because it’s too damn big (over 7 pounds when I attach my big lens), and photographing wildlife works best solo anyway. HOWEVER, this time I made an exception. Hauling a 7-pound camera around for 6 hours is a real drag, but it’s quite nice to have it if a photogenic creature shows up. 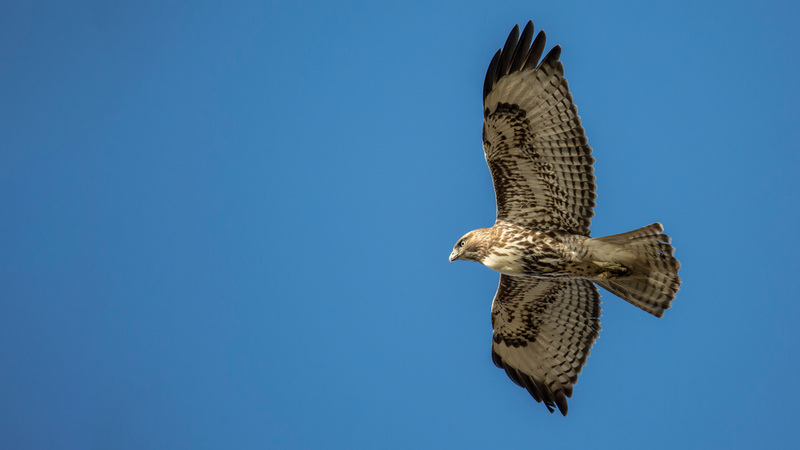 Although Red-tailed hawks are common in the Bay Area, it’s rare to see one up close, and very satisfying to get a decent photo of one in flight. QUESTION: “OK, so where’s the red tail?” This is a juvenile, so its tail isn’t red yet. I drove out to Staten Island again. In spite of the 2-hour drive, much of it through absolutely boring, flat industrial monoculture, I wanted to watch the Sandhill cranes at sunset one more time. The afternoon was cold and windy, and I was alone, parked on the shoulder of a dead-end gravel farm road. 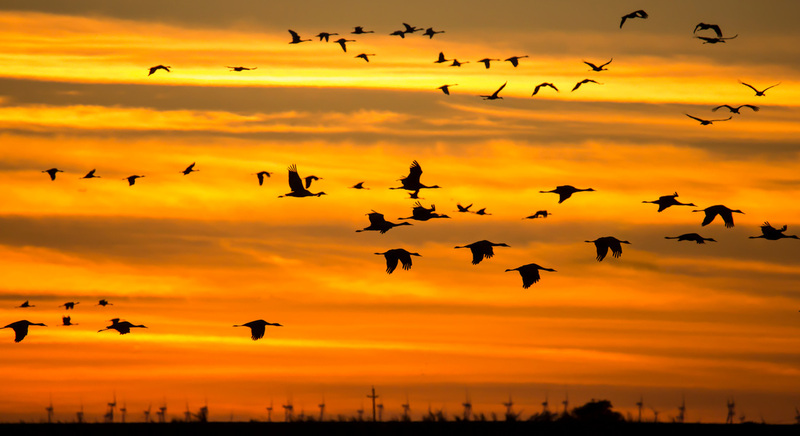 The corn had been harvested in September, but thousands of cranes, geese, ducks, swans, and shorebirds were carefully gleaning the Staten Island fields. 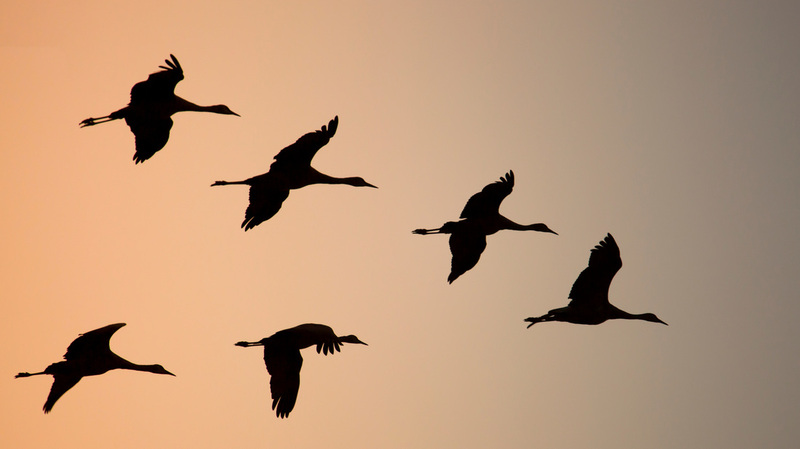 During the late afternoon, big and small formations of geese and cranes flew over me in random directions. 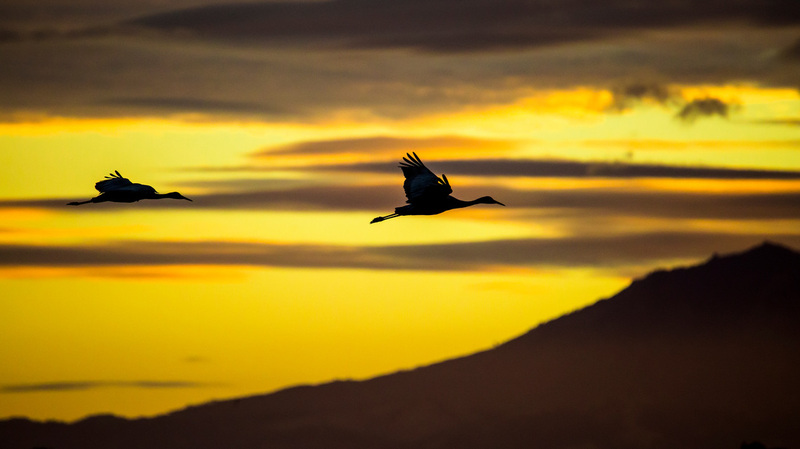 At about 15 or 20 minutes after sunset, the cranes began their nightly ritual approach and landing in the flooded field just to my west. The shadowy towers on the horizon in photo #2 are wind turbines. Since the introduction of Creature of the Day in 2009, a few rabid subscribers have hectored the editorial board with demands for EXPLICIT photographs of a “particular nature”. These subscribers (you know who you are) respect no limits. Respectability and COMMON DECENCY are incomprehensible abstractions to these Barbarians. They whine, they moan, they scream, they stamp their feet. And predictably, they threaten lawsuits. 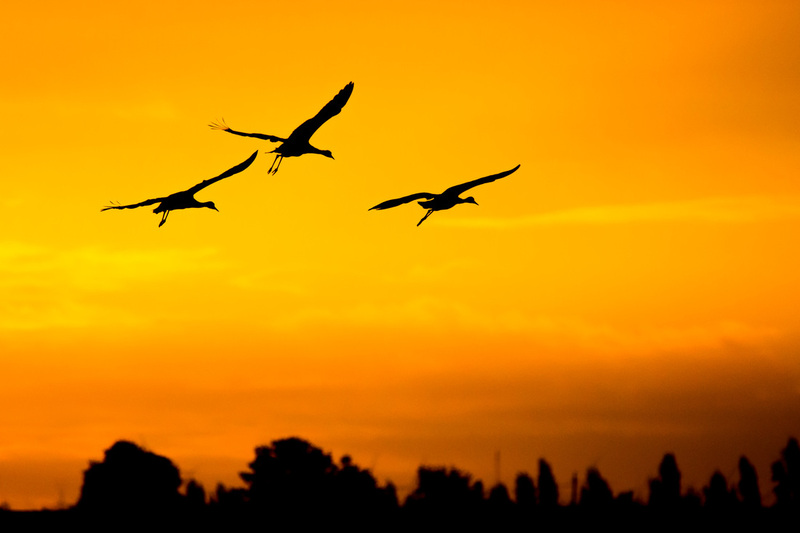 On Sunday (11/1/15) at sundown, I witnessed hundreds of Sandhill Cranes landing in a flooded cornfield on Staten Island. (No, not that Staten Island. This one is near Lodi in the California Delta.) 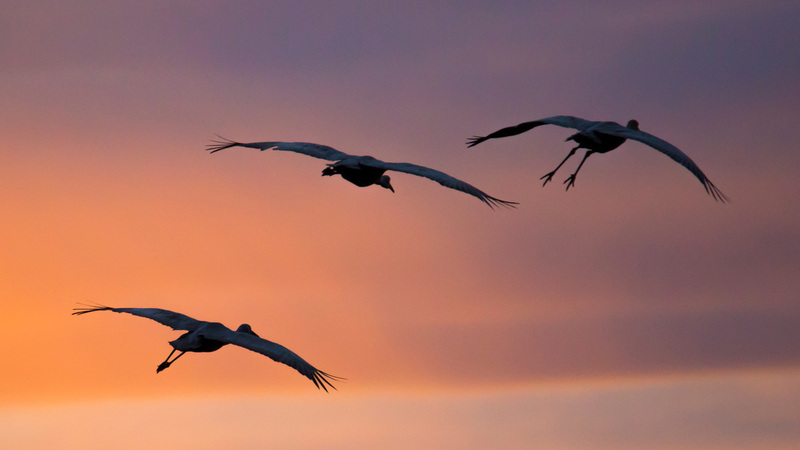 Five of us were positioned to the east of the cornfield, so the cranes’ slow-motion approach and landing presented us with the dark silhouettes of these great big birds as they drifted down in small groups against a spectacular sunset background to the west. It was 20-30 minutes of continuous WOW. I came upon this coyote hunting for rodents along the fence line. The typical coyote, fox, or bobcat road encounter goes like this: 1) I spot the creature while driving. 2) I pull the car to the side of the road. 3) Moving as quickly and quietly as possible, I retrieve the camera and set it. 4) I look up and the creature is calmly trotting away from me, showing me nothing but a “tail shot” from 100 yards. However, today I got a little cooperation. 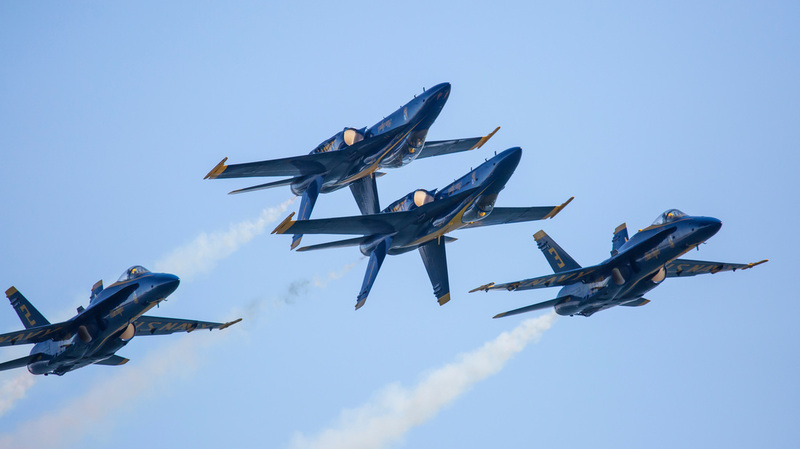 Those of you who live near the bay probably heard the ear-splitting roar of the Blue Angels’ F/A-18 Hornets over the weekend. 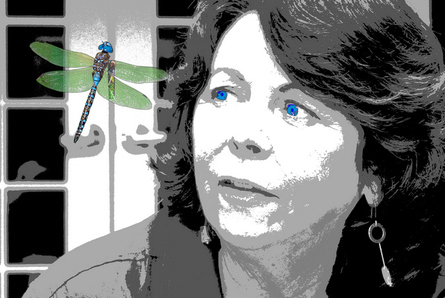 Nearly every year, the combined clout of Bay Area politicos (politicas? 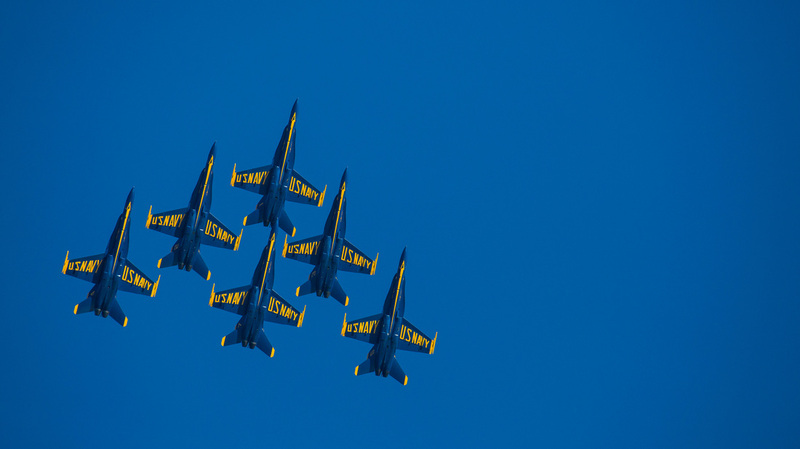 i.e., Feinstein, Boxer, & Pelosi) guarantees the San Francisco ‘Fleet Week’ performance by the Blue Angels. 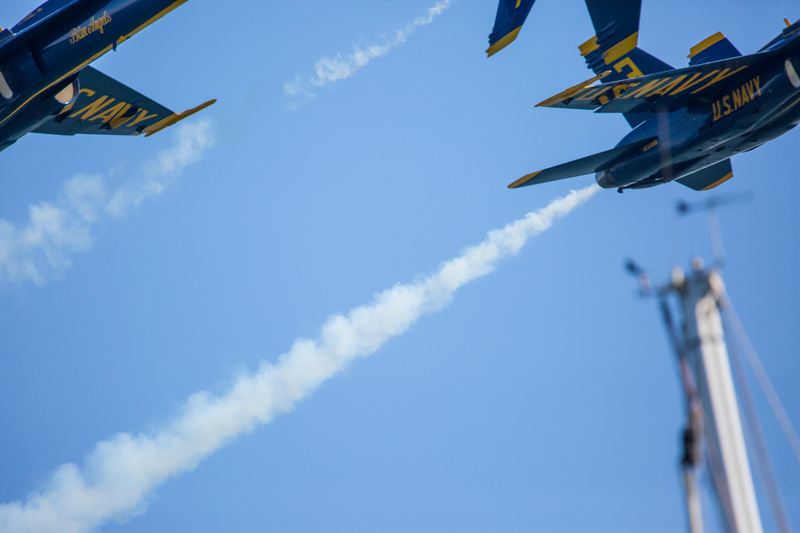 This year, we had the opportunity to view the proceedings from a friend’s sailboat positioned directly under the flightpath of the air show, just off the Marina Green. 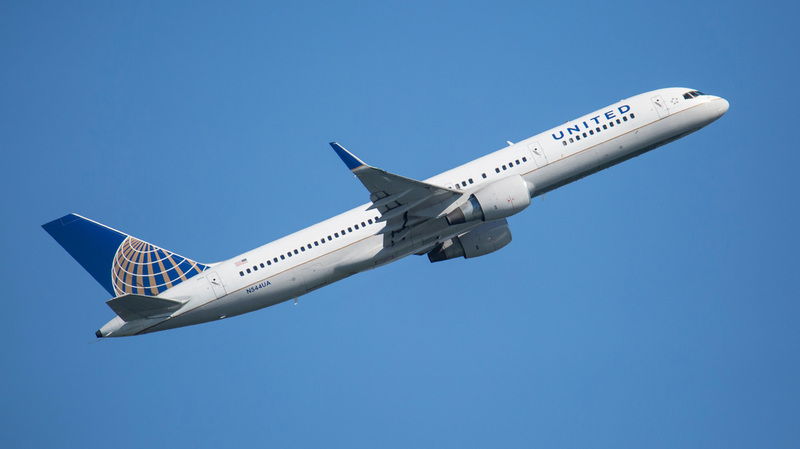 Ever since my flight-obsessed childhood filled with model airplanes (and airplane glue, but I’m fine, really), through my own experiences as a pilot and flight instructor, and to the present day – I have been, and am, a certified airplane freak. So it was without hesitation we accepted the offer to sail across the bay on a perfect, dazzlingly clear day (Friday) and see the show from the BEST location possible. It was almost too good. With the fly-bys so close, the noise level was amazing in a bad way, but the photo-opportunity was amazing in a good way. Today’s “creature” isn’t a creature at all, but the LUNAR ECLIPSE last night was so amazing I had to violate the sacred CotD bylaws. After dinner, Julietta and I went out to the bay shoreline near Peacock Gap in San Rafael to watch the eclipse. It was COOL! We stayed there for about 30-40 minutes shooting photos during the umbral phase of the eclipse. That’s when the moon was a dim reddish color – the so-called “blood” moon. Later we drove back to the East Bay and I shot the later photo as the moon half-emerged from the earth’s shadow. 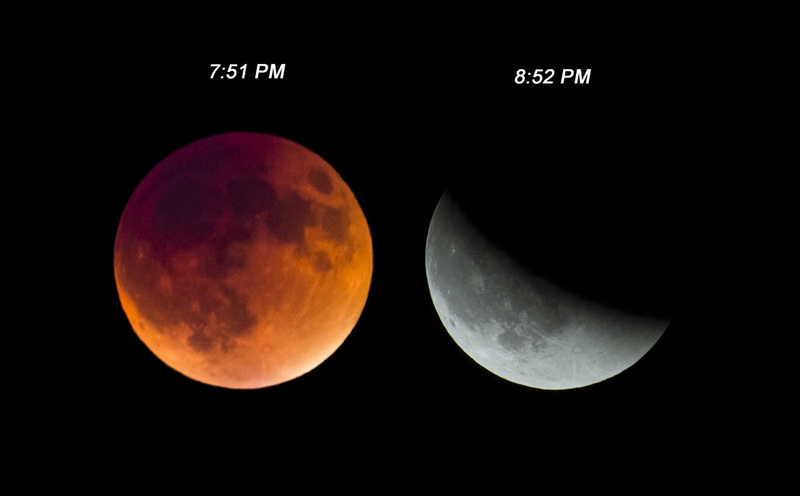 There are many excellent explanations of this very rare eclipse event OUT THERE on the web. Try a web search on “blood moon eclipse” and you’ll find everything from CLASSIC apocalyptic bullsh** to excellent science! YAY INTERNET! This is a photo of the interior of a Black Abalone shell that I borrowed from a UC Berkeley biology professor. It’s – and here comes our WORD of the DAY – IRIDESCENT. Of course we all know what that means: LIKE sparkly and twinkly, right? It means that the colors change as viewing angle and lighting change. Many of you are CERTIFIED WORD NERDS, and so you know that the root of the word “iridescent” comes from Greek ἴριδος (“iridos”) meaning “rainbow”. Iridescence is a very cool visual property of some sea shells, soap bubbles, wings and other body parts of certain insects, certain minerals - especially crystals (like diamonds), some feathers, and a few other things. 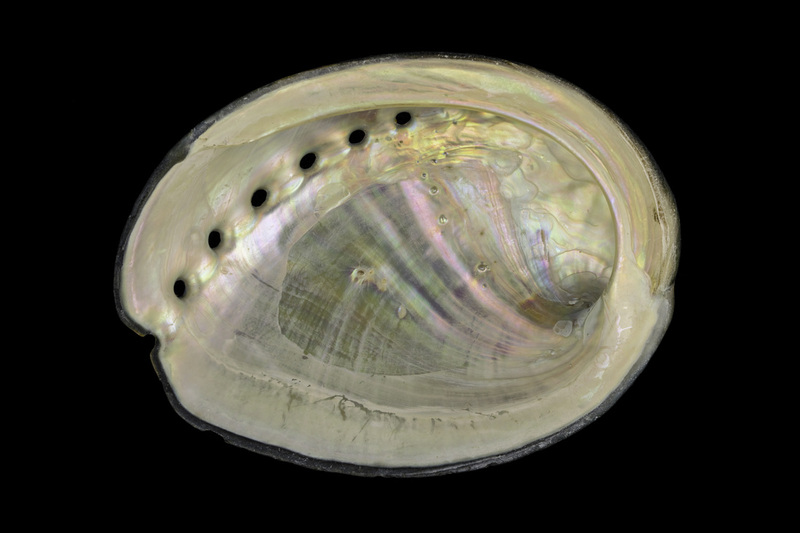 Black Abalone, a VERY-edible marine gastropod (snail) native to California and Baja coastal waters, is now a critically endangered species and protected by California and federal law. THE NEXT TIME I have the opportunity to create my own country, I’ll designate the Red-tailed Hawk as my NATIONAL BIRD. Yes, I know. Social justice, education, employment, health care, environmental protection, economic policy --- these are matters I’ll get to EVENTUALLY, but the NATIONAL BIRD must be decided immediately, because its image goes on money, stamps, and passports! As soon as I’ve completed my design for the uniforms worn by the Presidential Band, I’ll get the national bird officially designated, and then sort out all the other issues without delay. 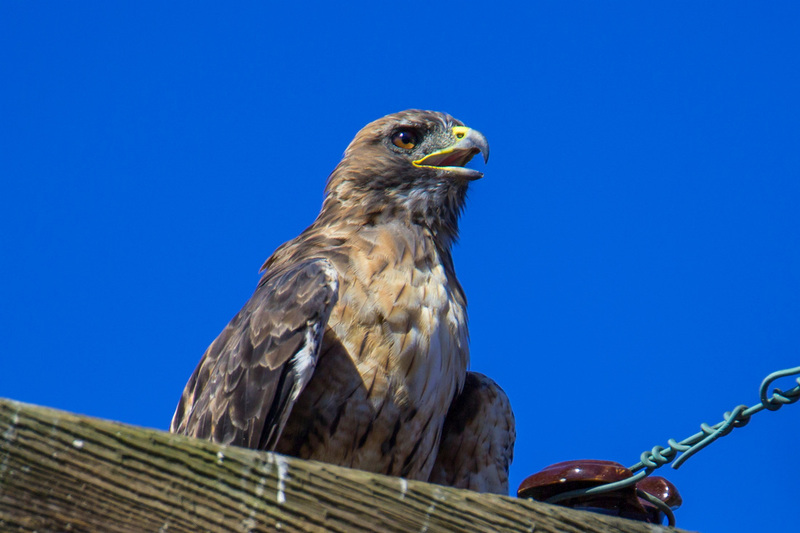 Red-tailed Hawks are common in northern California all year around, but it’s unusual to get close enough to see how awesome and spectacular they really are. I saw this bird perched on a power pole around noon today along Conzelman Trail in the Marin Headlands as I was returning from a training class at Fort Cronkhite. I had my camera and big lens on the seat beside me, so I pulled over and took the shot. Today’s photo shows a dangerous, volatile, and extremely rare confrontation between two ferocious green-eyed does. However, these animals looked rather evenly matched, almost mirror-images of each other. Creature of the Day biological research is GUARANTEED. We’d bet our reputation on it. When I was in elementary school, teachers would emphasize the seriousness of a test with the statement “This will go on your PERMANENT RECORD”. We all know that this is a powerful and serious threat. Just last week, I awoke in a cold sweat from a terrible nightmare. There are two basic versions of the recurring nightmare: Either 1) Julian Assange, or 2) Edward Snowden has hacked the San Rafael City Schools archives and stolen my PERMANENT RECORD. This information is LEAKED, using a specially-encrypted “air-gap” computer, to reporters from The Guardian during a covert midnight rendezvous behind a 7-11 in Milpitas. The Guardian, in a front page story, publishes all of it. Within minutes, TMZ, Buzzfeed, Gawker, Vox, Huffington Post, CNN (and, eventually, The New York Times) publish my PERMANENT RECORD. Now everyone knows my test results, along with all the other humiliating details recorded in my PERMANENT RECORD. ﻿﻿﻿And then I wake up. The GOOD NEWS for you is that there’s no need to DREAD the Creature of the Day EXAM -- just because the results do, indeed, go on your PERMANENT RECORD. For your convenience, our technical team has added Creature of the Day BACK ISSUES to the DS COMPOSITION website. This means that you can study back issues of Creature of the Day for hours and hours, every day at your convenience. Yay! Today’s Creature of the Day is the Black-crowned Night-Heron, a true superstar species, making its third appearance this year. What’s up with that? 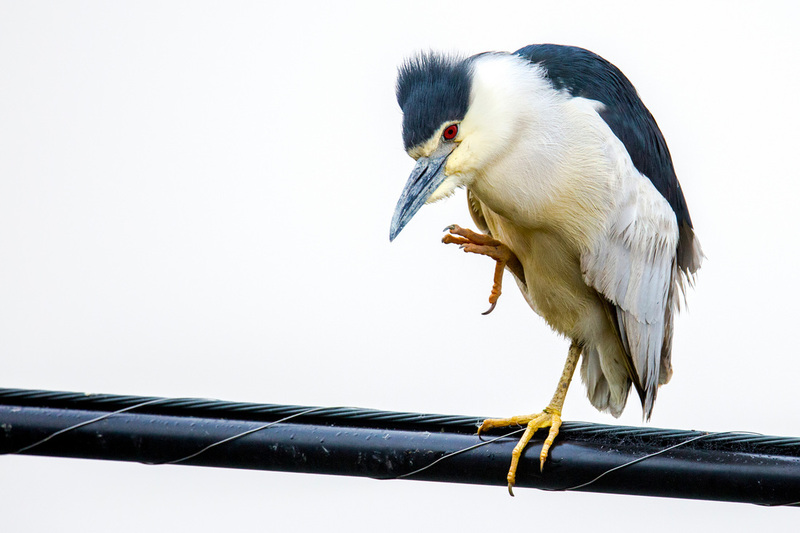 I’m not sure, but this bird showed up this morning near Stinson Beach, perching about 100 feet away (on the same utility wire) from the position of our June 8th Black-crowned. It’s definitely a different bird. This one, mouth wide open, had something to say, apparently. Factoid: Many birds stand on one leg to reduce heat loss from unfeathered (and so, uninsulated) legs. ﻿﻿Some birds just look like birds. If you’re an LBB (“little brown bird”) --- generic, boring, and loved only and grudgingly by your parents (for a couple of weeks, max), you can look forward to a life of grey ennui and grinding tedium. Excitement might peak when you decide to GO BIG and write a Yelp review about your periodontist. Yowza. 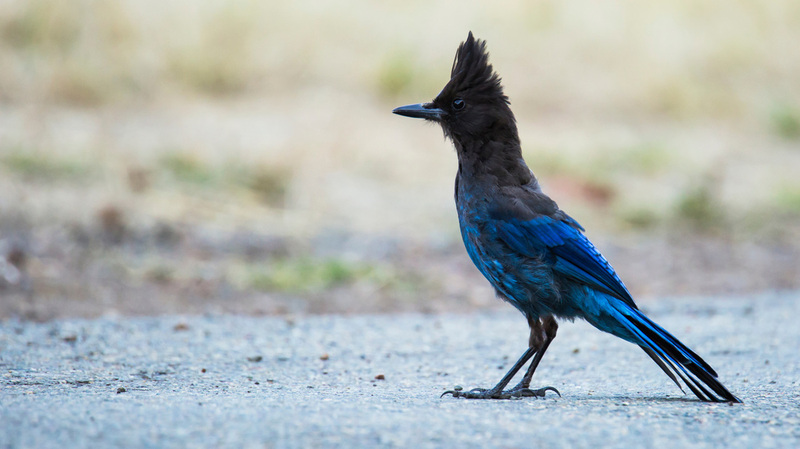 ON THE OTHER HAND if you’re a SPECTACULAR PARTY ANIMAL like the STELLER’S JAY, you’ll lead a life of limos, frenzied paparazzi, and maybe even an appearance on Celebrity Apprentice! Wow! FACTOID: It takes considerable time and gallons of gel to perfect the CREST-DO. 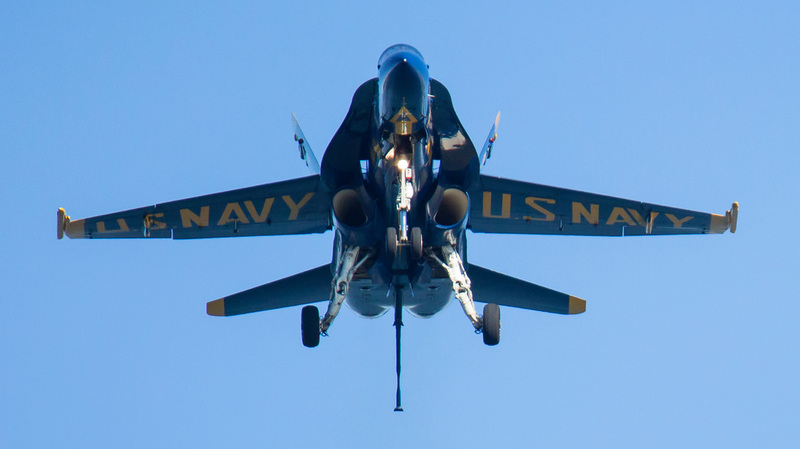 While sitting at my desk at about 8:00 this morning, I heard a sharp metallic sound, about halfway between a CRACK and a BANG. I recognized the sound immediately – a bird had flown into the glass sliding door that leads from my office to our deck. 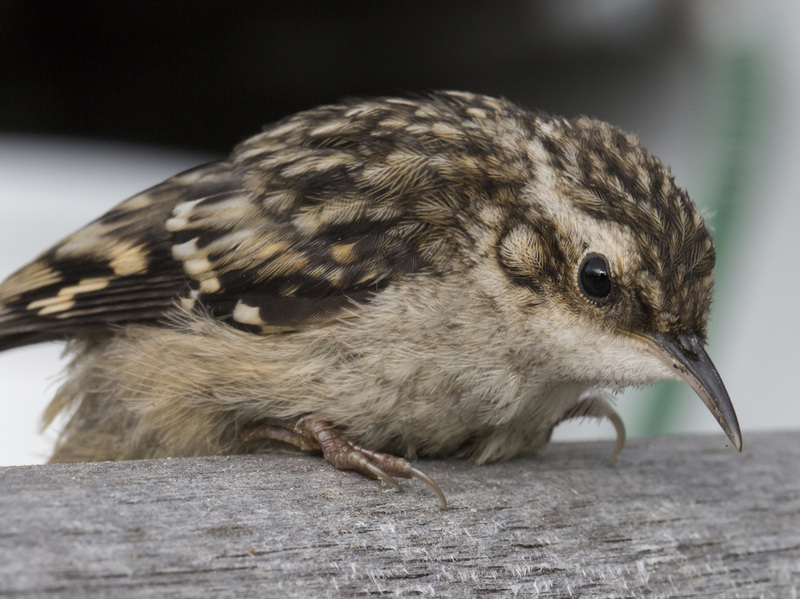 I saw a very small brown bird, not much bigger than a hummingbird, face-down, wings spread on the deck just outside the door. It was a Brown Creeper, a nice little forest bird that’s common, but rarely seen because it’s usually camouflaged so well against the brown tree trunks where it makes its living feeding on bugs. I picked up the tiny bird. He (she? could be…) was knocked out cold. However, I could see that his heart was still beating, and I didn’t see any obvious injury like a broken wing or damaged bill. After about 10 minutes of rest and warming in my hand, he started to move and struggled to get up on his “feet”, so I placed him on a wooden tool handle so he could try to perch. He perched rather weakly, but stayed upright -- more or less. That’s when I grabbed my camera and quickly shot the attached photo. Suddenly (and rudely interrupting my photo session), our creeper jumped toward the outside wall of the house, trying to climb it like a tree, but the hard stucco didn’t provide any traction, so he slid down the wall tail-first and disappeared through a small gap in the decking. I grabbed a flashlight, climbed over the railing, and crawled under the deck head-first. Although the spiders were large, menacing, and merited further attention, I went looking for the bird. Within about two minutes, I located and re-captured the Brown Creeper, who was still too weak to fly much. I climbed back onto the deck with the bird in my hand, and took him upstairs to show Sherrie our tiny rehab patient. We took our visitor outside. After a few more minutes of rest, the little bird pulled himself into a proper perch position on my finger, rearranged his feathers, aimed himself in the direction of the rising sun, and flew off into the woods of Wildcat Canyon. DARTH VADER, you’ll recall, was a Dark Lord of the Sith. Although he was the father of totally-badass-but-GOOD Princess Leia and eventually-MODERATELY-badass-but-GOOD Luke Sykwalker, he was EVIL and fully committed to the DARK SIDE of THE FORCE. All Sith Lords have either red or yellow eyes. And -- HELLO -- the devil has red eyes! So, CLEARLY, red or yellow eyes indicate EVIL, whereas GOOD is associated with blue eyes (e.g., Sherrie, Paul Newman, Luke Skywalker, certain dragonflies). PLEASE NOTE: It’s impossible to know for sure if brown-eyed creatures are good or evil. You’ll have to check other parameters. 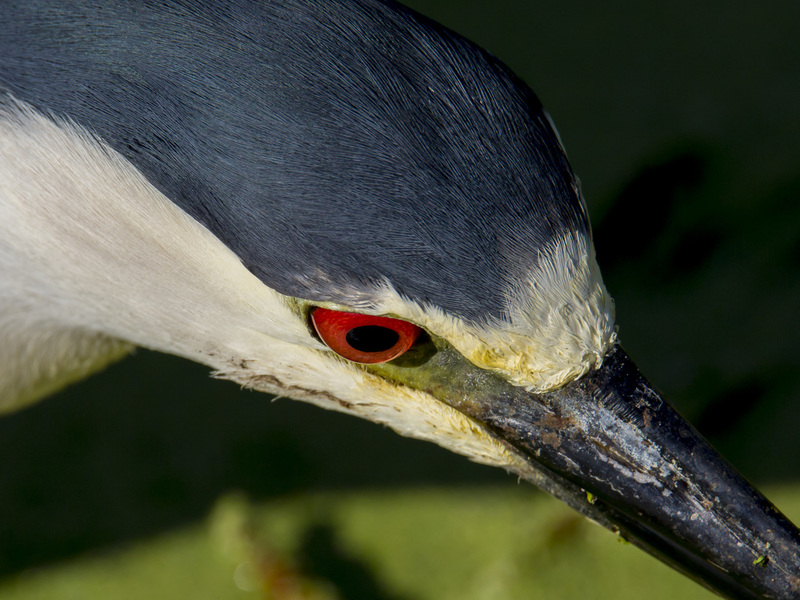 Recently I had the opportunity to get close to this Black-crowned Night-Heron. He was fishing with intense concentration and paid absolutely no attention to me, so I kept moving closer, shooting a few frames – and then moving closer again. The end result was this shot, which shows off his vivid red-orange eye color. We can infer that this bird is EVIL. I hadn’t visited my favorite osprey nest site at Kent Lake for quite a while, so this morning I left the house at about 5:30, arriving at Alpine Dam around 6:30. From Alpine Dam, it’s an easy 3½ mile bike ride along a nearly-flat gravel road to the nest site. I got there just before 7:00. Within a minute, I spotted our two suspects perched very high up in separate trees, each about 150 yards from the nest and about 100 yards from each other. They preened. They looked around. They preened some more. Then they looked around some more. For two hours. If I’m ever reincarnated as a bird, I will have more fun in my spare time than these guys. OK, a little preening is fine. Let’s all try to look our best. But TWO HOURS? Jeez. So for two hours, 7 pounds of camera and I were focused and ready. 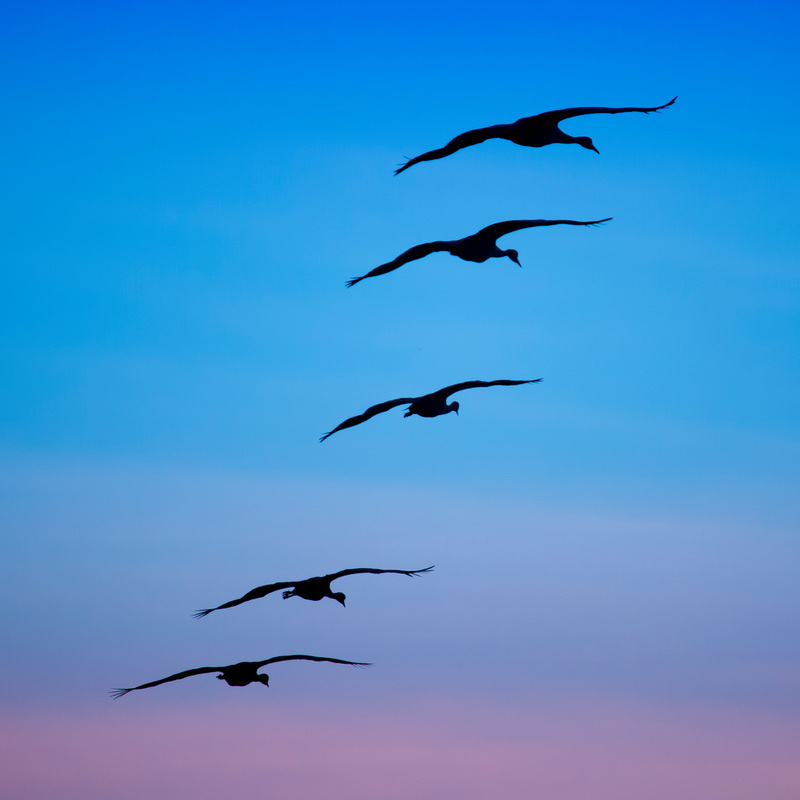 Suddenly, apparently responding to a secret signal, they simultaneously flew off their perches and disappeared downward toward the lake surface – which I couldn’t see from my location. A few minutes passed, and then they both suddenly reappeared on an approach to the nest, flying right toward me. The male had something in his talons. Click. Click. Click. Click. Click. This is typical wildlife photography. Do nothing for two hours with finger paused over the shutter button; then take 20 pictures in about 5 seconds. 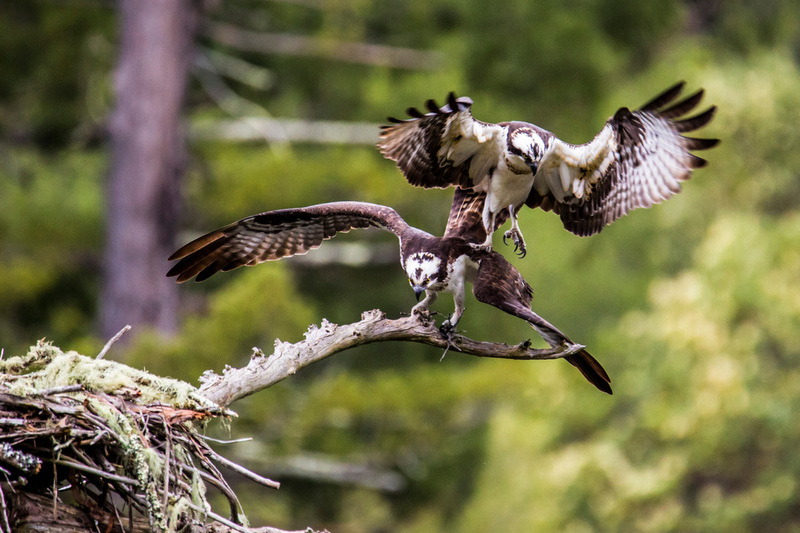 IN THIS PHOTO, the male osprey (on the right, wings spread) has just offered a fresh fish breakfast to the female. She is devouring it. Maybe he’s generous – even chivalrous – or maybe not. He arrived at the nest with 2/3 of the fish “missing”; so perhaps he snacked a bit on the way home. 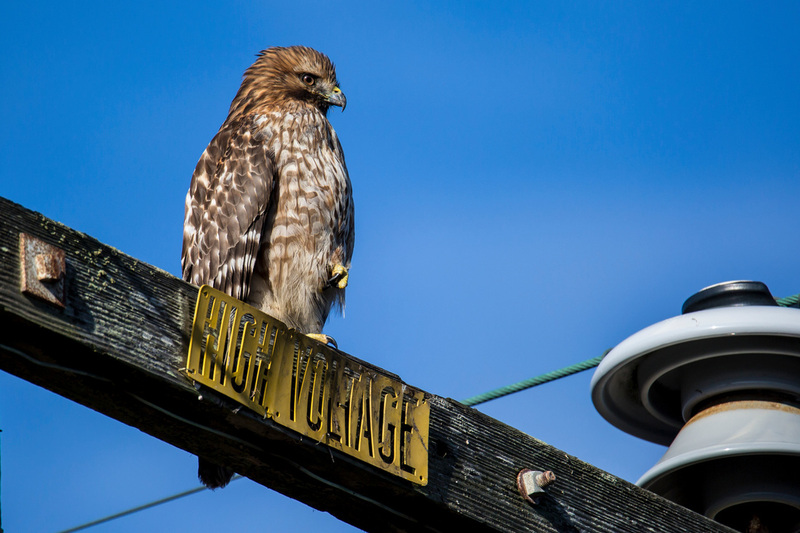 Early this morning, I spotted this handsome bird perched on a utility cable strung along Highway 1 between Stinson Beach and Bolinas. I stopped the car, grabbed my camera, and sat down on the lagoon side of the road to shoot some pictures. He (this is a male) was quite tolerant of me and my camera. I shot pictures for about 15 minutes. His head feathers look pretty punk, but only in this frame. I shot about 50 pictures of this bird, and this is the only one with “erect” head feathers. I haven’t come across any research regarding the head-feather display, but I suspect it indicates photographic-modeling-overload, because it’s the last frame I captured before he flew away. 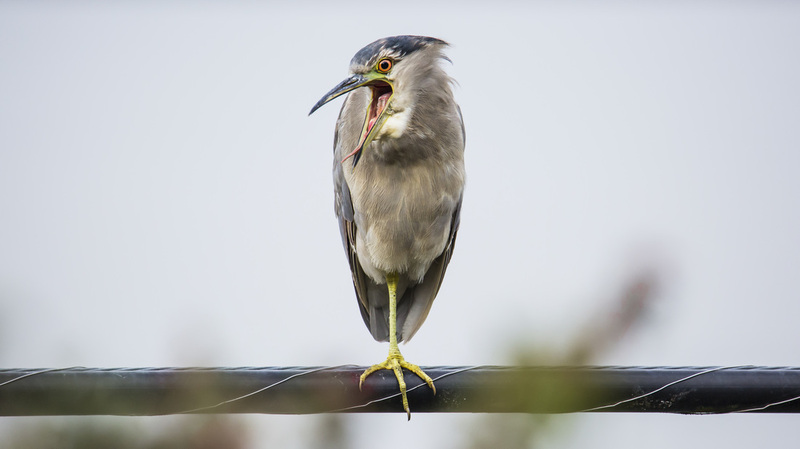 Why is this bird called a NIGHT-heron? Herons (and egrets, which are white herons) hunt during the day. This bird hunts at night. The word “wide” evokes certain images. So - what’s “wide”? I live in California where the automobile is sacred, so we Californians naturally(1) think in terms of automotive metaphors. WIDE evokes an image of a Hummer directly in front of us in heavy traffic, and not just any Hummer, but the iconic Hummer H1, a civilian version of the massively-wide High Mobility Multipurpose Wheeled Vehicle used by the US Army and US Marines, commonly known as the Humvee. That’s WIDE. Now we can proceed with our important consideration of today’s Creature of the Day, the AMERICAN WHITE PELICAN – which is an enormous bird with a typical wingspan of 9 feet. WOW! That’s a foot wider than the biggest Hummer. This comparison is just FYI, in case you were wondering if an American White Pelican, with wings outstretched, is wider than a Hummer. Yes, it is. 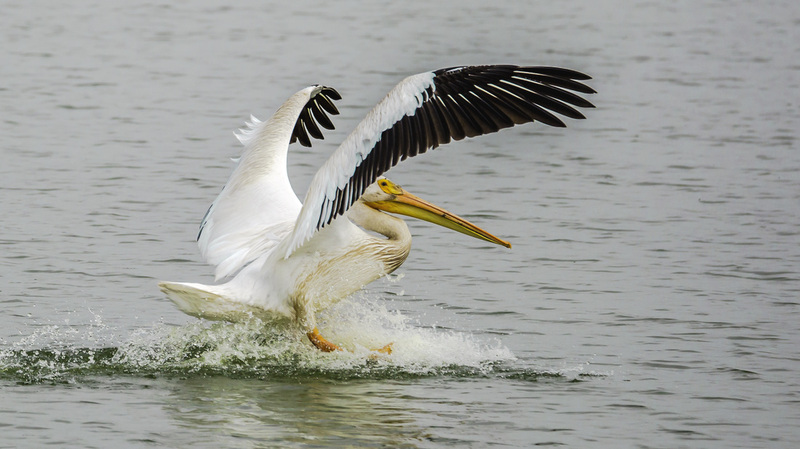 The American White Pelican is majestic and graceful in flight, but not so impressively graceful and majestic when not-in-flight. 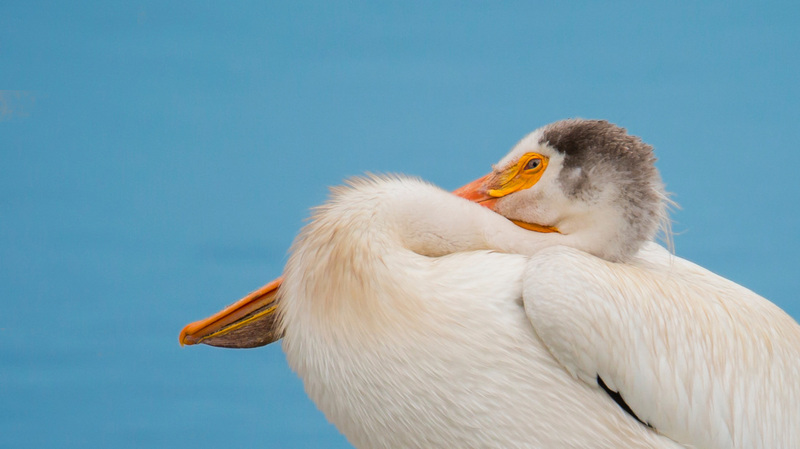 In the first photo, the pelican is perched and tucked into a ball to keep warm. The second photo shows our handsome pelican landing on a (sewage treatment) pond. It’s a shame that there’s no scale reference in the photo (e.g., a Hummer) to indicate the huge wingspan of this impressive bird. Early this morning I visited an amazingly reliable hot-spot well-known to Bay Area amateur and professional bird-nerds. Although the name “Las Gallinas Sewage Treatment Plant” might suggest a facility that processed the output from chickens, the signature bouquet wafting from the tangle of pipes, tanks, and humming pumps suggests otherwise. We all understand the need for sewage treatment, but there’s MORE! The vast system of ponds that plays an important role in tidying up the water exiting the plant prior to its discharge into the bay attracts BIRDS like crazy. Wow. 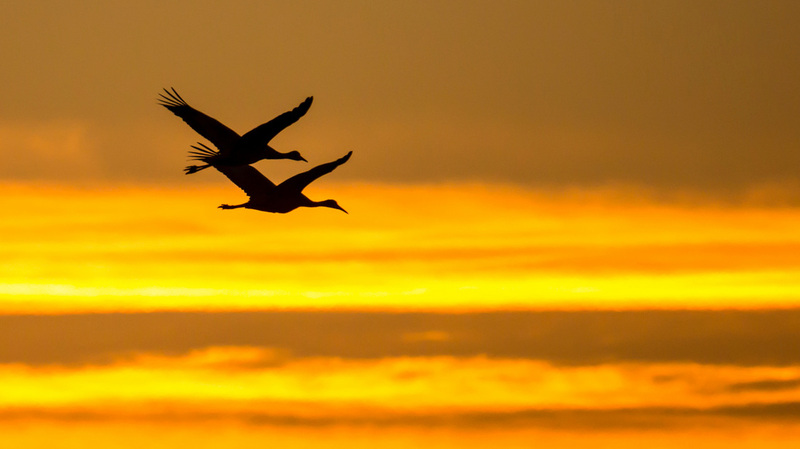 Not only can one find scores of species of birds at Las Gallinas, but also birders. Birders are very easy to identify if you know how to profile them. Aside from rare exceptions (like men), look for OLD LADIES with VERY EXPENSIVE BINOCULARS suspended from orthopedic-looking SHOULDER HARNESSES (NEVER ordinary neck straps; duh) and wearing RIDICULOUS HATS. Bingo, you’ve spotted a birder. These are some of the nicest people in the world and they love to talk about birds, but usually in a whisper. Interacting with this demographic brings to mind a word most of us use rarely, if at all, and that word is “spry”. Yes, these ladies are almost always -- spry. (Please raise your hand if you’ve used the word “spry” within the last 20 years.) So, I had a nice talk with a 85-to-90-year-old birder lady about the Marsh Wrens, which I was trying to photograph. She was lamenting the fact that she could hear them but hadn’t seen any. I pointed out a few. She was delighted. Marsh Wrens are common at “the ponds”. They usually stay among the dense cattails and tules, but they make lots of noise, so there’s no doubt that they’re there. They sound like old Singer sewing machines. 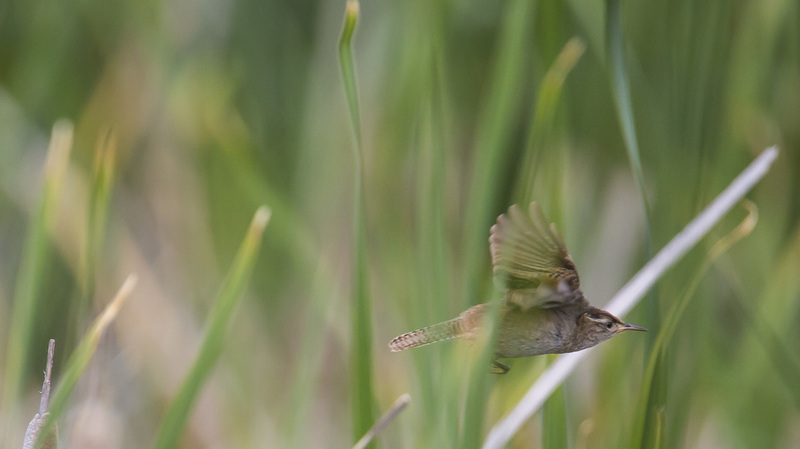 Marsh Wrens are small and very fast, so I was happy to get this shot of one in flight. Early last Friday morning, I walked the trail out to Abbott’s Lagoon in search of a Creature of the Day candidate, but with no particular creature in mind. After a couple of hours watching some cool birds (about 15 species) and lots of brush rabbits, I saw this beautiful coyote (Canis latrans) on the way back from the beach at around 8:45 AM, and I shot the photo from about 100 feet. I have seen many coyotes, but this one is definitely the most robust and handsome coyote I’ve ever seen. QUESTION: Could this coyote win best-in-show at the Westminster Dog Show? ANSWER: YES. I believe this coyote is a male because the female (in late April) would probably be either very close to delivering a litter (i.e., massively pregnant, typical litter size is six), or nursing that litter. Coyotes occasionally breed with domestic dogs. Let’s be honest, this can lead to “profiling” from narrow-minded domestic dog owners. Sure, the coyotes have some rustic habits, but who doesn’t eat a mole or a rattlesnake once in a while? Besides, coyotes have also been known to mate with wolves. So, we can conclude that coyotes are socially adaptable and seriously committed to diversity. Coyotes are mostly carnivorous, eating rabbits, ground squirrels, mice, etc., but also sometimes eating fruits, berries, and almost anything else. They sometimes hunt in packs and are capable of taking animals much larger than themselves, e.g. deer, sheep, or cattle. 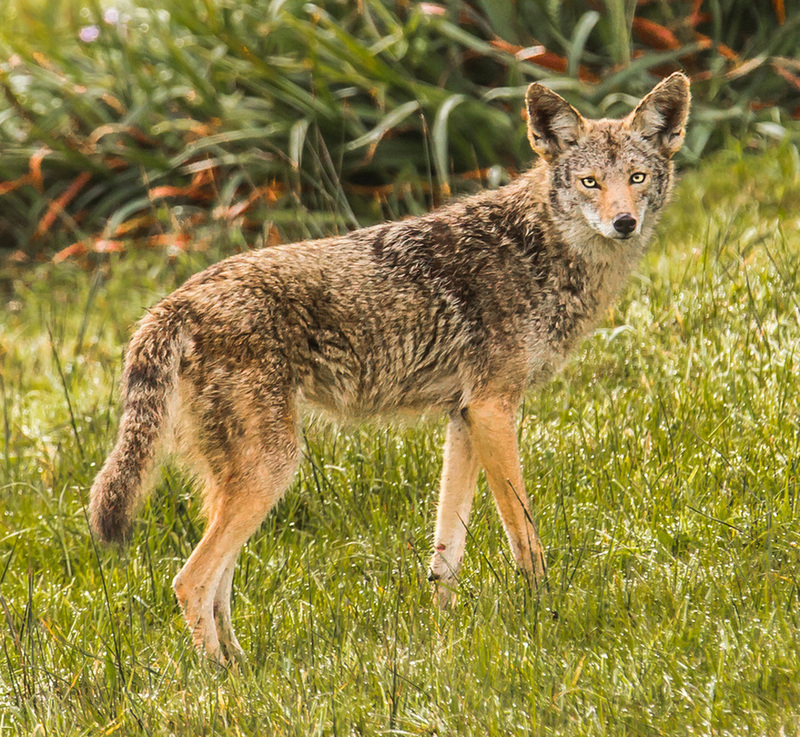 Coyotes are endemic to North America. The ecological niche occupied by coyotes in North America is occupied by jackals in Europe & Asia. The Spanish word for “coyote” is “coyote” (note italics). This will be on the test. 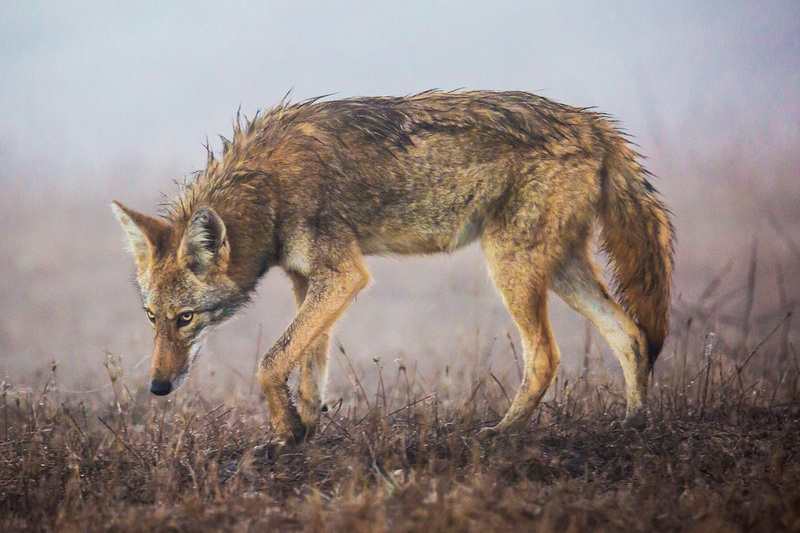 The life span of a coyote living in the wild is up 14 years. Listen carefully tonight. I think many of us should be able to hear coyotes howling and yelping nearby. Good Night. Wild Turkey is brand of American whiskey distilled in Kentucky. It’s Bourbon whiskey, which, according to people who sell Bourbon whiskey, is a very important distinction. In the spirit (!) of Creature of the Day, let’s proceed with some factoids, because we are committed to the ongoing education of our subscribers. It has to be distilled from at least 51% corn. It has to be aged at least two years in new, charred oak barrels. It can’t have anything added besides distilled water (no flavorings or colorings can enter any bottles). HOWEVER, the Wild Turkey we’re featuring today is a BIRD, not a Bourbon. 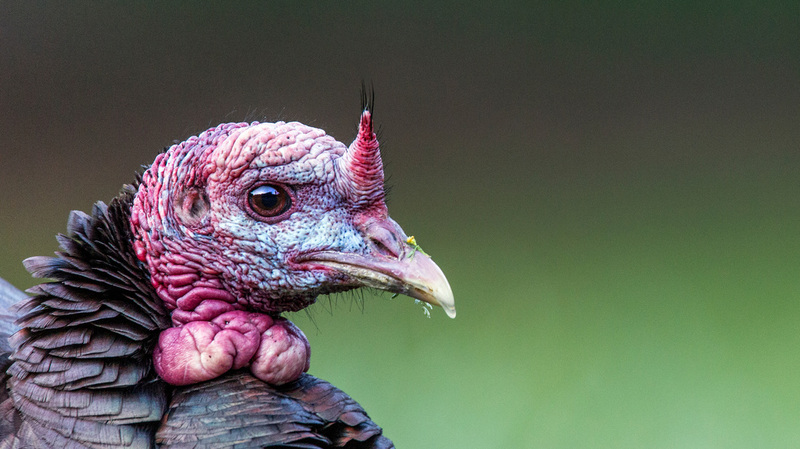 Wild Turkeys are natives of North America. The turkey was first domesticated and raised for food by indigenous people, probably in Mexico, about 2000 years ago. 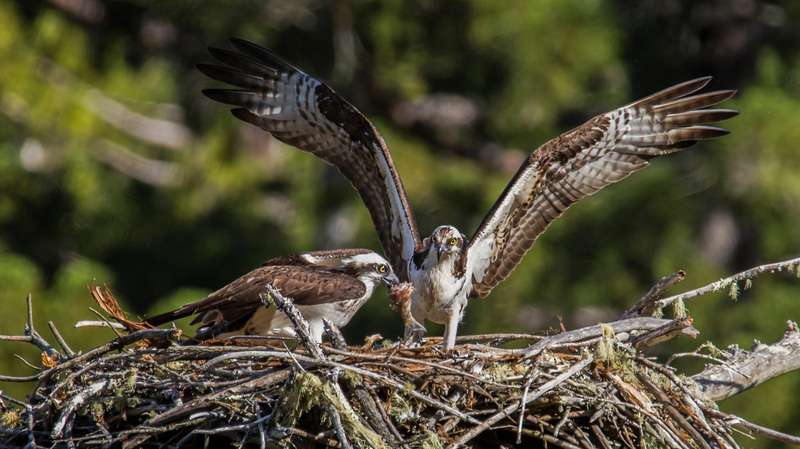 On several occasions last year during spring and summer, I photographed ospreys at nest sites on Kent Lake. These sites are about 3 miles from Alpine Dam along a gravel water district road that leads to a pump house. The road is gated and not open to vehicle traffic (except water district trucks once in a while), but it’s an easy bike ride, so I load my camera, lens, and tripod in a backpack and ride out there very early in the morning. The rising sun lines up nicely to illuminate the birds when they face my position on the road. It’s a remote, quiet, and beautiful place that gets very few visitors. Today was my first trip to the nest sites this year, and the ospreys (same individuals? I don’t know…) were back, remodeling the very large nests with new materials. The first photo shows bird-1 (the female, I think) with a twig in her talons just after she arrives at a branch extending from the base of the nest. Although I try to stay out of sight behind foliage, she seems to be looking straight at me. 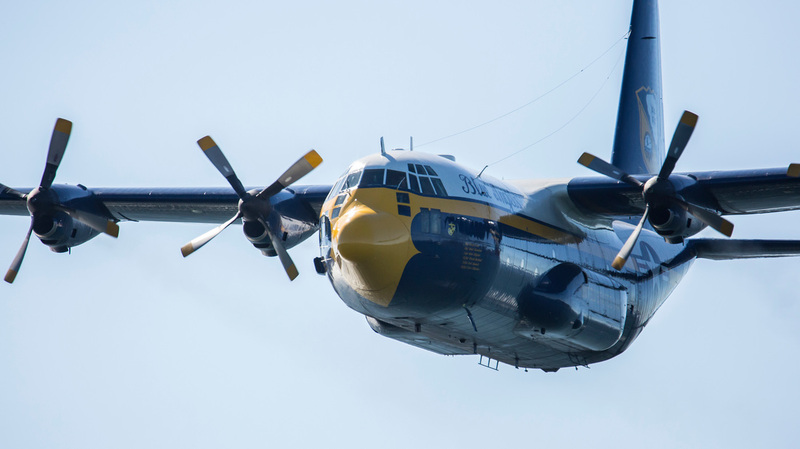 The second photo shows bird-2 making contact from above, as if trying to land on top of bird-1! This is might be a copulation attempt. So bird-2 is the male, right? I’ve been wandering around watching, photographing, and occasionally capturing assorted creatures since my childhood, but in recent years it’s become more important to me to identify them. “What’s that?” is the first thing that I ask myself when I see a bird on a wire, or a butterfly, a spider, a snake - whatever. Sometimes, answering that question is very easy because I’ve seen and identified the creature before. I know at a glance that I’m looking at a Scrub Jay or a Gopher Snake or a Honey Bee or a Turkey Vulture. Over the years I’ve learned to identify many of the creatures commonly seen around Bay Area (especially Marin), but of course I also see animals that I can’t identify. If I’m carrying a camera and mange to get a decent photograph, I try to identify it using field guides and online resources when I get home. I have accumulated a pretty good collection of field guides, and I’ve also collected links to all kinds of excellent online resources to help me identify animals and plants. The process of identifying some living thing is generally based on the system first published in 1735 (and revised 12 times) by the incredibly famous Swedish botanist, zoologist and physician Linnaeus called Systema Naturae. This is an iconic work of biological categorization (https://en.wikipedia.org/wiki/Systema_Naturae ) which is still cited in academic publications today. Linnaeus codified the system of binomial nomenclature, the use of “Genus species” convention used today in most biological taxonomy. Of course, huge advances in biology since Linnaeus (e.g., Darwin & Wallace à evolution through natural selection, genetics, discovery/description/function of DNA, cladistics, gene sequencing, etc.) have radically changed much of Linnaeus’ 18th century ideas about life, but the general idea of a ranked hierarchy of categories is still used in one form or another to identify organisms. The bird in today’s photograph is a good example of my own process for determining the identity of an unknown creature. Sherrie and I were hiking near the top of Mt. Tamalpais yesterday and encountered this cool bird. When I saw it, I knew it was a woodpecker, but I didn’t know which one. Fortunately, I had my BIG camera+lens with me (all 7 pounds of it) and was able to take several photos. When I got home, I looked at my two bird field guides and quickly narrowed down the possibilities to two birds, the Hairy Woodpecker and the Downy Woodpecker. It was easy because I knew the bird was a woodpecker. The field guides are normally organized according to Families, a rank first established by Linnaeus and still used by most biologists today. The woodpeckers (Family: Picidae) are grouped together in the field guides. The drawings and photographs helped me narrow the possibilities down to two based on the appearance of the birds. The guides also briefly describe behavior, vocalizations, range, diet, and other characteristics to help determine if your tentative ID based on appearance is reasonable. For example, even though my bird looked a little like a Three-toed Woodpecker, the range maps in my Sibley guide showed that Three-toed WPs were not normally seen anywhere in California, so I eliminated that from my search. 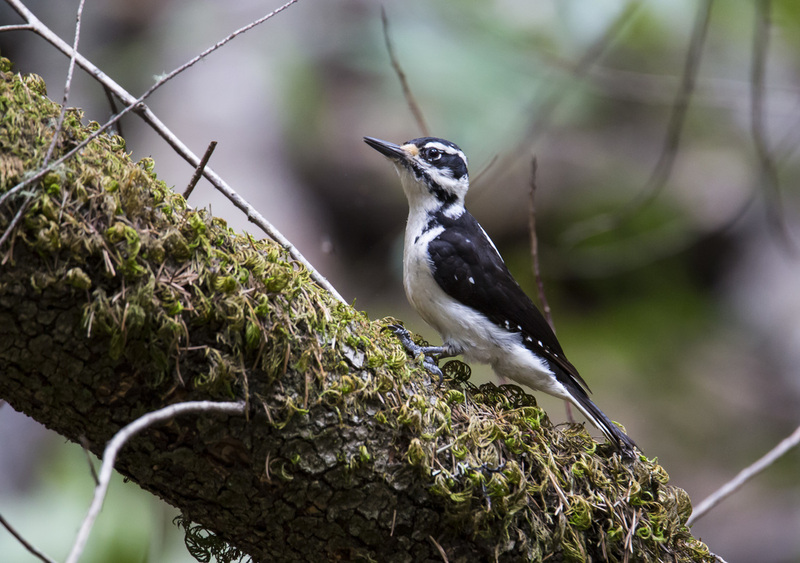 Field guides have their limits, and I needed help to confirm the bird as either a Downy or Hairy Woodpecker – which look remarkably similar in the guides. I sent the photo to Amy, and also to a contact I have at Golden Gate Audubon Society. Although I had tentatively identified the bird as a Downy WP, both Amy and my Audubon sources said “No, it’s a Hairy Woodpecker”. So be it. It’s a female Hairy Woodpecker. Interesting factoid about woodpeckers: They use their tails like a third tripod leg to prop themselves up – as seen in today’s photo. Personal unscientific observation: Woodpeckers are usually impressive, spectacular birds with an amazing range of crazy vocalizations. Acorn woodpeckers are often heard (even by me) before they’re seen. They have a big repertoire of goofy vocalizations including a very rapid “hahahaha” that is thought to be the model for the signature laugh of the famous avian star of TV and movies, Woody Woodpecker. Of course Woody looks more like a Pileated Woodpecker, with the crest and all, but we should avoid relying on cartoons as authoritative field guides. The following factoid is for MATURE AUDIENCES: Acorn woodpeckers engage in what ornithologists DELICATELY refer to as “cooperative breeding” or what non-ornithologists call “orgies”. 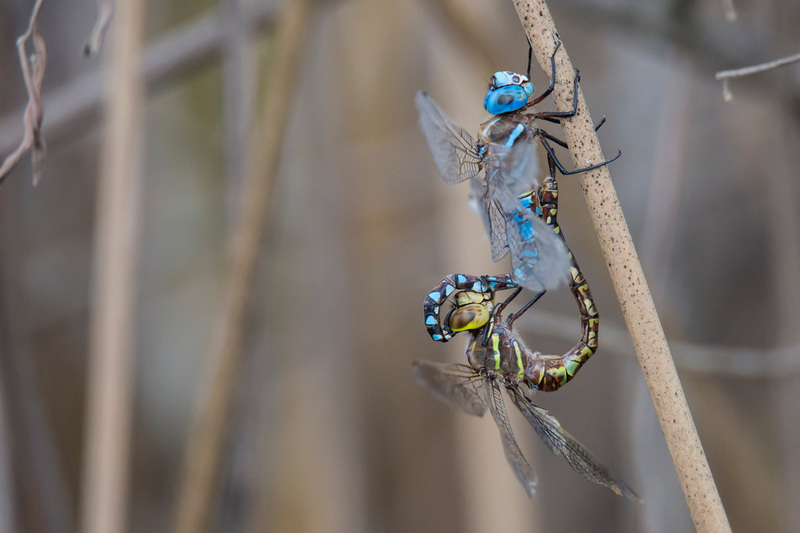 With up to seven males and three females in a breeding group, it’s looking like the females are the more committed partiers. 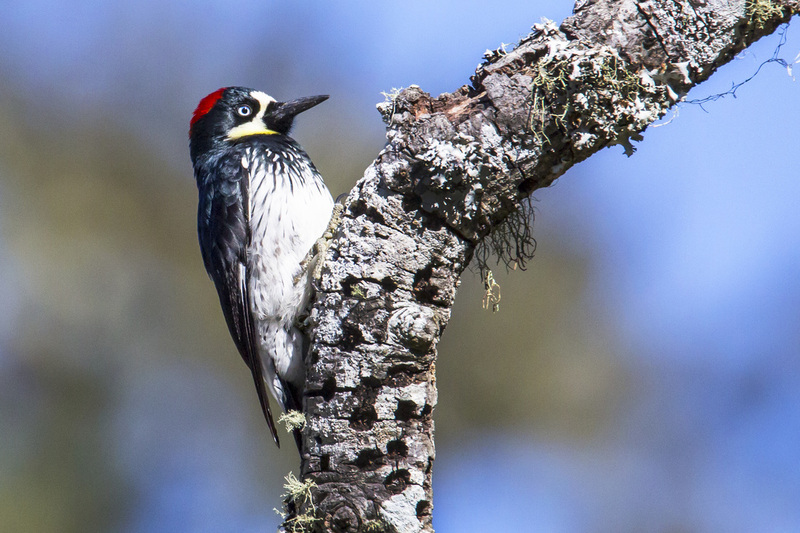 Perhaps this is why acorn woodpeckers laugh so much. The acorn woodpecker in this photo is a female*. I took the photo early this morning near the Point Reyes Bear Valley Visitor Center. * Males’ red caps start right behind the white forehead, but females have a black area between the white forehead and the cap. Brown Pelicans are not the biggest birds out there, but they are VERY BIG, especially compared with the gulls and cormorants that are often mingling with them. 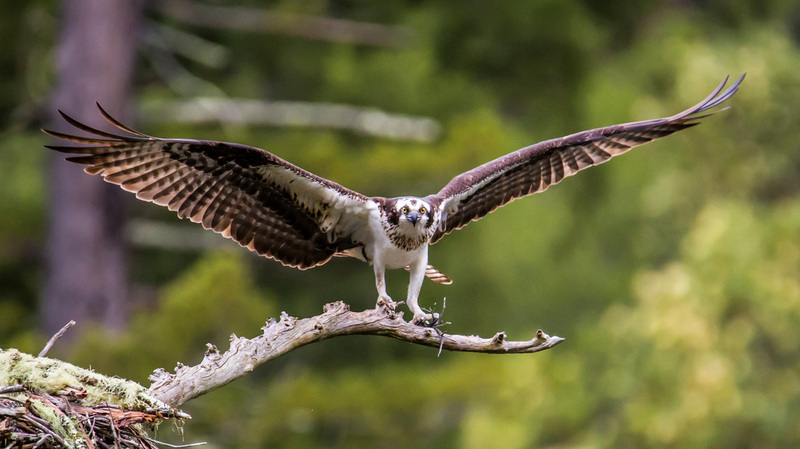 With a wingspan typically exceeding 6 feet and weight up to about 11 pounds, that’s a lot of bird! 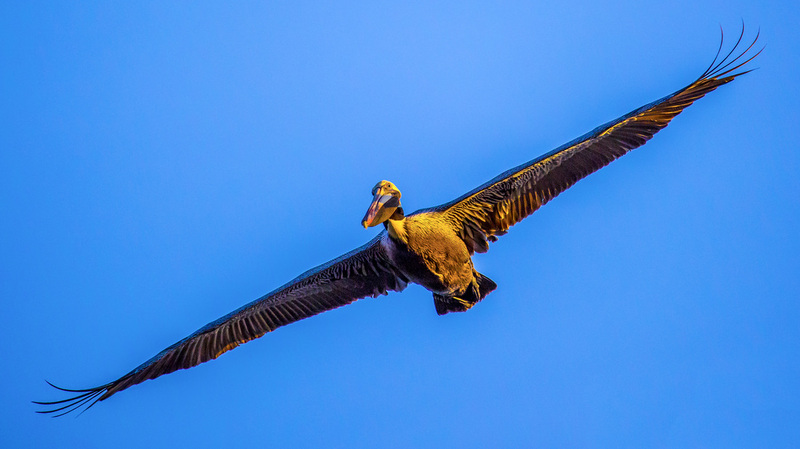 Pelicans look like awkward, goofy cartoon characters when perched on a piling or walking on a beach, but they are graceful and majestic in flight. DID YOU KNOW? The California Condor is the biggest extant flying bird in North America, slightly smaller than the Andean Condor, which is the biggest extant flying bird in the world. Based on a fossil discovered in South Carolina in 1983, the biggest ever found is Pelagornis sandersi, a bird that lived about 25 million years ago with a wingspan of over 20 feet. WOW. I took the photograph at sunrise this morning near the Marin anchorage of the Golden Gate Bridge.